← October Pullip Line Up Announced- Snow White Finally! 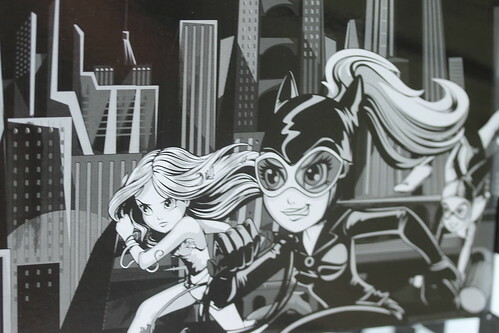 Generally speaking I am not really all that interested in Polly Pockets but when the SDCC exclusives were announced and they turned out to be based on DC Villains well they caught my attention. 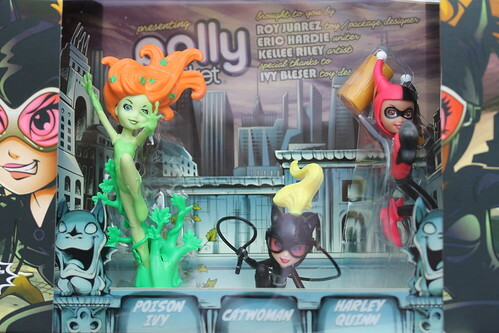 Honestly when I first saw the set, I didn’t even recognize them as Polly Pockets, I thought they are a new line of cutesy DC figures specifically designed to destroy my paycheck once I figured out what they were well it didn’t change anything because I needed them. 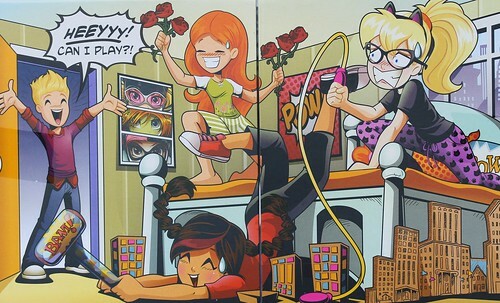 The set includes Lea cosplaying as Poison Ivy, Polly Pocket as Catwoman and Crissy as Harley Quinn. 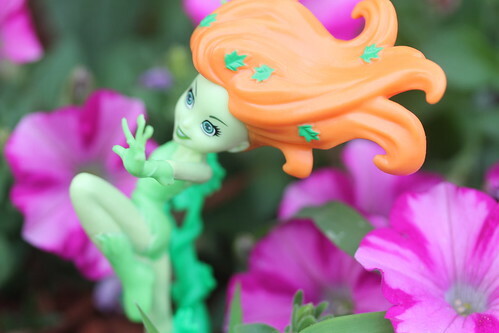 Although Harley Quinn is by far my favorite of the three characters, I must concede that the Poison Ivy figure is by far the best done of this set. I was lucky enough to be able to obtain a set from a friend of mine that attended SDDC this year. When they arrived a very unique problem arose, their packaging was so awesome I didn’t want to debox them. Top of the box, I am especially fond of the top of the box even if the text is slightly cheesy. 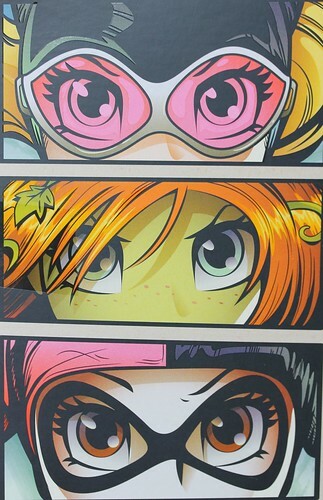 Sides of the box- If they made this into a poster I would buy it so fast, just saying Mattel x DC comics get on that like now please! Back of the box- I love the facial expressions. This pic brings me back to when I was a little tyke watching the Batman animated series and pretending my friends and I were the villains (yes, even then I nor my friends had any interest in playing the good guys). The box slides open to reveal the sweet, sweet innards err.. Polly Pockets. Close up of the NRFB Polly Pockets. So long story short, the package was such a work of art I didn’t want to destroy it…which of course raises the question of how I have photos of a deboxed set at the start of this article. I and what seemed like everyone else in the known universe (servers crashed like whoa) went camping on mattycollector and snatched them up when the exclusives were added to the shop post-SDCC. 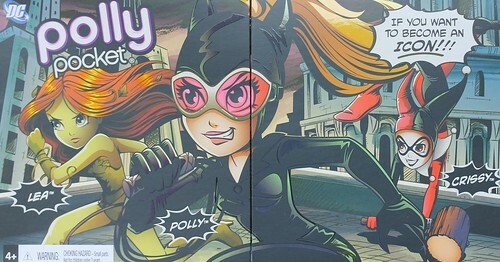 Polly Pocket as Catwoman. 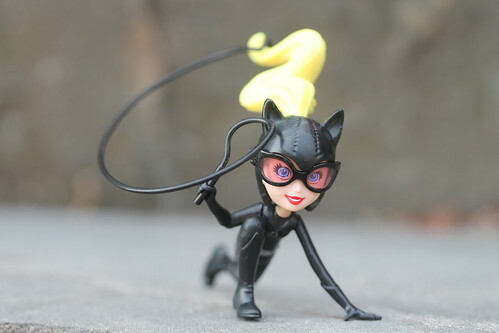 Not the biggest Catwoman fan in the world but I have to admit this figure is super adorable. In a perfect world she wouldn’t have the billowing pigtail coming out of the back of her mask but that is a Polly Pocket thing, I guess. Crissy as Harley Quinn. She’s got a paint flaw on one of her eyes T_T Harley’s pose is downright bizarre which makes photographing her kind of difficult. 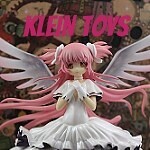 She’s really cute I just wish she had a stand of something to aid in keeping her upright. 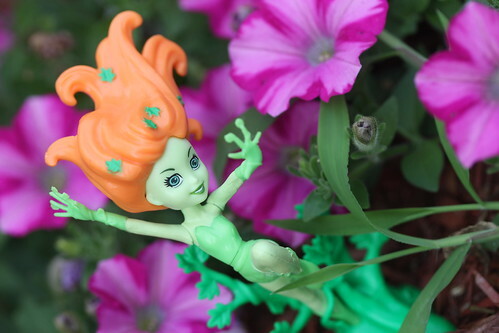 … and my personal favorite Lea as Poison Ivy. No complaints about her whatsoever, she is just way too adorable. Believe it or not more photos of these can be found on my flickr. 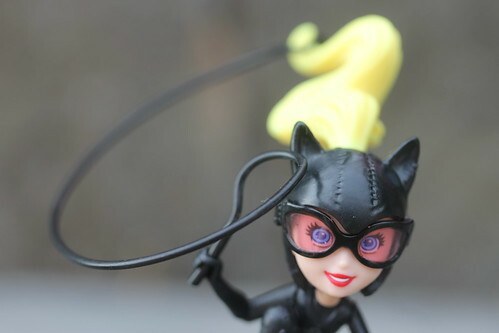 This entry was posted in Comics, Doll and tagged catwoman, dc comics, dc villains, harley quinn, poison ivy, polly pocket, sdcc, sdcc exclusive. Bookmark the permalink. Oh My gosh! My inner child and inner nerd are having a fist fight over these! 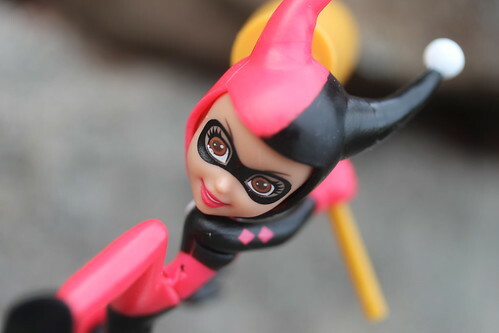 (When I was a kid Polly pocket was the size of your pinky nail…) I love that the Polly pocket peeps are finally making a note to little girls that superheros (and villains) aren’t just for boys. When I was a kid they were mad tiny too, they fit into these like large compact-style things I guess the little ones are now considered choking hazards My little girl has a couple of the newer Polly Pocket figure/doll things but she isn’t that into them. I’m really glad Mattel released these they were quite unexpected but they did a Masters of the Universe themed Polly Pocket release last year so I guess the line between boy and girl toys is finally blurring.